Do Poodles Bark a lot? 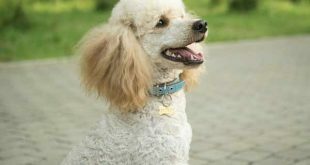 The small sized poodles such as the Toy and Miniature ones are known to have bad barking habits, as this statement is not really true. Barking is a way for the dogs to be heard, as every dog does it for some reason. Howling is the method dogs use to communicate with each other. As we all know, dogs are famous for their sharp senses, as they can feel other dog’s sense as well, although you may not notice it. Low tone barking is when the dog sees something new and unknown, as it is not sure if this is safe or a threat. The idea behind the low tone is to show that it feels something strange and unusual, that way be dangerous. If everything is fine, the reason behind the barking might be something that passes nearby. High pitched barking is when your dog is willing for your attention and it wants to be noticed. The most common reason behind it is that the dog has its needs and it wants to inform you that it is time for a walk or play time. When you hear growling, the dog tries to warn you. The growling goes all the way to low toned barking. When something unknown for the dog tries to approach, the dog gets territorial and tries to protect their space. Growling is very dangerous act, and if you hear it, be sure to keep distance and move. Growling is the dog’s way to warn humans or nearby animals that they are now welcomed here. This act can be a combination of other noises or change in the dog’s position. If the growling is combined with ‘tooth snapping’ noises, this means that the dog is ready to attack and use its teeth. The pre-striking position means the same, so be sure to show the dog that you are leaving. Whimpering is the type of noise the puppy does. This noise is the same, as the adult’s whimper. The meaning of the noise is that the puppy feels ignored and lonely. Whining is what the adult dogs do when they feel an emotional distress. The dog does that when it feels you are about to leave the house, or when they want to be alone. Another reason behind this may be that the dog feels pain. If this is what really happens, the dog won’t let you touch it, as it will lie down. If the pain is very intense, the dog will feel extremely frightened, as it can start to act aggressive. One very good advice if you want to prevent unwanted barking is to find the reason that hides under it. It is very important to take care of the situation immediately. New people entering its territory. Unknown people or animals that are approaching. Those problems can easily be solved if you are taking a good care of them- socializing and training are the key to success. If the dog is left home for long periods of time, this may cause Separation Anxiety. There are a lot of articles out there about this issue that should be read. 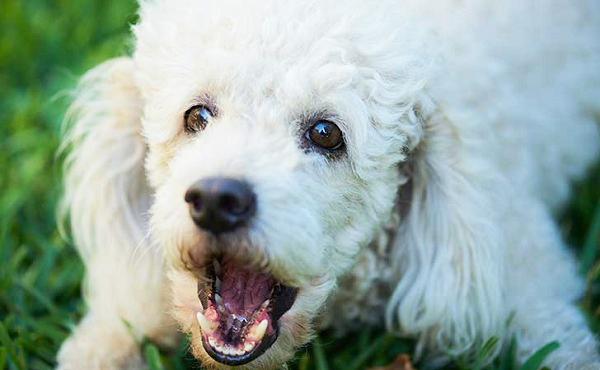 Socialization training will help you Poodle get rid of its habits of barking at doorbell rings, family gatherings or people passing by when you are taking a walk. The self-esteem of the dog, as well as its behavior are very important traits that you need to work on, as the whole process won’t take much time. Don’t give up on your goal. Every training should be consistent, as you need to spend quality time of your day in order to achieve the wanted results. “Positive Reinforcement” should be shown to your dog only when it is behaving the way you want. The “No” word should be forbidden, because showing bad attitude can make your dog feel anxious and unlock series of genuine issues. Try to be patient and don’t take the Poodle’s barking inward. Ignoring the negative behavior will show the dog that you are not interested and you won’t tolerate such acts. As they are still in their training period, you need to show them what is right, and what is not, as they are not aware of that. 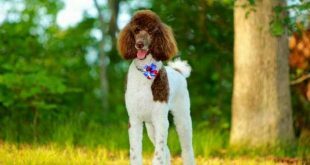 Poodles find interaction and companionship extremely valuable, and when they see things are not right, they will surely change their attitude. Dogs often think that lightning are dangerous and that they are threat to their security and the one of their territory. Thunder noises are loud for us, but for the dogs, they are even more harsh, because the sensitivity of the dogs is 1000 times bigger than ours. High winds may cause the production of high pitched sounds that can be heard only by the dogs, as they can fall into horror. The rain drops that hit the roof can make your dog feel annoyed, as they have very intense sense of hearing. The air pressure is something very familiar to us, as we can feel when a thunder is in the forecast. As it was mentioned previously, dogs’ heightened senses are may stronger than ours. Although, training may not help with solving the problems mentioned above, the training process will surely have positive effects on your dog’s socializing and behavior. The barking that was caused by thunders won’t be so severe after long period of training. Tapes with recorded storms can make a huge impact and change the game. Be sure to check some of them online, purchase them and see what the results are going to be. Poodles are super protective when it comes to their owners. Dogs bark when they are not familiar with the environment or the people, as they think this may be dangerous for you. 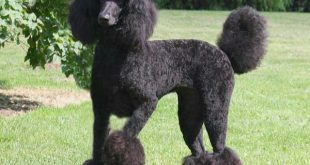 Although, those factors may not be threats, if the Poodle is not trained properly, it may feel everything threatening. You need to be clear enough and show your dog there is nothing to worry about. If the Poodle starts barking, be sure to stay calm and the dog will see that everything is good. One very essential thing almost every owner does is to pay attention to their dogs when they start barking. This should be banished, because all the Poodles want is attention, and if you stop giving it, they will learn from your actions. Some of the Poodles are too anxious and find everything hazardous. They method to show they are scared and they are ready to protect themselves any cost, they start to get aggressive. Territory and security are the things they protect the most, and if they feel like their space is not secure, they will definitely show it. One tip to make the dog more calm is to organize all of its belongings to certain places, like putting the bowls in a corner away from the other family members. 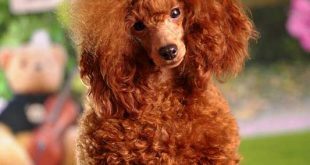 Poodles can become over protective when it comes to their food, that’s why owners need to be extremely careful. Do not try to be near them while they are eating, as this can unlock series of unwanted situations, that would be hard to be eradicated. Every dog is born with instinct of self-preservation, as they know the food is the most important thing. Leave your dog alone while it eats, and when you are giving it the food, be sure that the space around is clear and there are no other people to disturb the dog. Always keep in mind that the crowded room can confound and make the dog feel insecure. Toys are another very special thing for the Poodle. They can start being over protective when it comes to their toys, if they get attached to them. This is not a problem that cannot be resolved, as all you need is time and understanding. But be sure to watch out if your dog starts to become aggressive if someone gets close to their belongings. In order to keep a good hygiene and protect your dog from diseases, its toys need to be washed every 2 weeks. The best time to clean them is when the dog is not in the house, or when it is sleeping. You should organize your dog’s toys and find them a special place, which will belong to your dog. If you have toys for games, they should be placed in other container, away from the “regular toys”. When your Poodle gets bored, there is a big chance of barking. This may be caused, if they are not trained and socialized properly, or they don’t have enough toys to play with. A lot of people think that getting your Poodle a lot of toys is spoiling, which is definitely not true. Poodles are extremely attached to their belongings and it is good for them to have something to lean on when they are alone at home. The best way to keep your dog’s mind engaged is to get it enough toys and separate them into two groups, so that way you won’t need to spend a lot of money, and your dog won’t get too attached to them. One trick here is to get colorful toys with sounds and interesting textures. Excitement can be another reason why barking is involved. This can be fixed with proper training, as they get older, they will realize the barking is unnecessary. Excitement is something great, as it shows how happy your dog is. There is nothing bad for your dog to show its excitement, but be sure to teach it how to demonstrate it right. Because Poodles are very social and attached to their owners, the excitement can get huge, no matter the age of the dog. The best way to lose the interest in them of getting super excited is to demonstrate them different picture when they see you at the door. Don’t get excited like them and they will learn from your actions. A lot of people find it hard not to pay attention to their dogs when their get home. But this, to be honest, is the best method of preventing over excitement in your dog. Controlling your actions, will help your dog control its emotions and behavior. Give yourself some time when you get home, without paying attention to what the Poodle is up to. This habit of yours will work effectively, if you are doing in on a daily basis. When your dog sees that you are not excited as they are, they will see that this is not right and they will learn from their mistakes. Night barking can be extremely annoying and frustrating. The night is for rest and you should not give up on your sleep just because your dog is barking. Barking for attention is something that every dog should learn is not right and should not be practiced. Ignoring the barking and telling them calmly “Quiet” will make them learn and understand what are your intentions. If barking is intense, then let your dog sleep in your room, but show them that they have a special place, that should not be overstepped. Dogs learn from their humans, and as you are tired and ready for bed, they will see it and will do the same.